Feel free to use these photos in all publicity materials. Simply click on the image to view a larger image which you can then download and use. Bonnie is an educational consultant and advocate who helps parents find solutions to help their children overcome their special ed challenges. As a special ed mom herself, Bonnie has dedicated the last 11 years to researching solutions to help recover her oldest son. She is the author of Special Ed Mom Survival Guide: How to prevail in the special ed process while discovering life-long strategies for both you and your child. She is also the creator of Grounded for Life: 52 Exercises for Daily Grounding, and co-author of Same Journey, Different Paths: Stories of Auditory Processing Disorder. She has a masters in educational counseling and another in spiritual psychology. She is an Associate Professional Clinical Counselor and PPS credentialed School Counselor. Bonnie has spent the better part of 25 years as a graphic designer and artist. Always a lover of psychology and the forces that influence behavior, it was a natural transition for her to begin working to resolve her child’s challenges. When he was six, a neuropsychologist said he was beyond help, and to plan for group home care as an adult. Bonnie could not accept that nothing could be done, and she set on a path to find solutions to help her son. He is now an honor student and destined to live a typical life. Having been through the special ed system as a mom, and now as a counselor, she saw the need for support for the parents who carry this challenging burden. She has helped parents who struggle with districts who refused services, and she has coached parents in finding ways help their child succeed against the odds. Bonnie knows the fear a mother feels when her child’s future is uncertain, and that is why she chose to shift her life focus into educational consulting. She has a thriving practice as an educational consultant and advocate for parents who find themselves struggling with the special education journey. Find out more at www.SpecialMomAdvocate.com and www.LandauDigital.com. 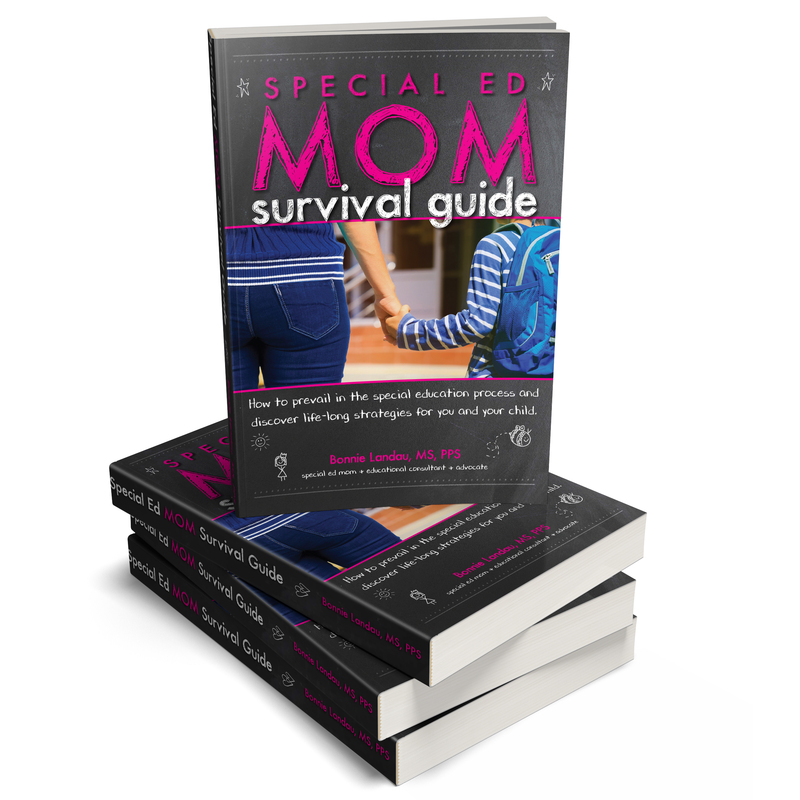 Why did you write the Special Ed Mom Survival Guide? In a nutshell, I want to help moms to help their kids without the moms losing themselves in the process. It is an emotional roller coaster and no mom is ever prepared for it. I want to provide supports that allow the mom to have her eyes open so she isn’t blindsided by the emotions or process of special education. I also want to help moms take charge of their child’s education. If they rely only on the school to fix the problem, the child may lose years of opportunity to make gains. Moms need to see the full breadth of what is available to help their child improve and possibly even recover. What is the big take away you want moms to get from your book? While this process is challenging, YOU can be the one to make the biggest difference in your child’s life. Take charge of your child’s education and find solutions that will have a life-long impact so your child can achieve optimum success. How do I get my child evaluated for special education? This is probably one of the most asked questions from parents who are confused as to how to navigate the system. Bonnie can help explain the process, what should be expected ,and what to do when schools try to circumvent the law in order to avoid giving services. Advocates are not lawyers, but they do have extensive knowledge about laws regarding special education. An advocate works with you to identify the needs of your child and then strategizes on how to get the schools to provide the proper support. You can ask an advocate to come with you to special education meetings or act as a coach, guiding you through the process. An educational consultant provides guidance and support for finding the proper placement and services to help your child thrive. My focus as an educational consultant is to make sure parents are aware of all methods for supporting their child with a learning disability. This includes in-classroom accommodations and support to help compensate for the disability. This also includes finding outside programs, tutors or therapies that can improve the challenges or remediate them all together. How do I know if the school can’t help my child? Often parents wait years for improvement, and when the child is significantly behind, they then have to decide whether to fight the school or look elsewhere to help their child. Many children are not going to improve unless they get specific therapies that the school is not allowed to offer. Parents need to know when to cut their losses and turned to alternative sources to help their child improve or manage their learning challenges. How can my child self-advocate to get the right support? Bonnie has developed a step-by-step advocacy coaching program that teaches students how to ask for the support their IEP or 504 guarantees. Many children are not aware they can ask for help, let alone the specific accommodations they need. Bonnie’s advocacy coaching helps them develop the knowledge and skills to become their own best advocate. How do I know if my child is diagnosed properly? This is a huge topic of conversation as medical research and case studies are showing that there are many underlying causes of typical diagnosis such as ADHD, dyslexia, autism, sensory processing disorder and more. How can a parent know if the child has the right diagnosis and is therefore getting the right therapies to help? Bonnie can help reveal some of the key signs that may indicate it’s worth looking further to see if there is an underlying condition that can be helped, thus resolving the symptoms of the disability. Why won’t the school give my child services? When a parent does start asking, why do so many schools refuse services? Bonnie has created the 8 Reasons Schools Say No program to help parents understand the intricacies of the school decision making process. While money is often the most common reason, it is not the only reason. Understanding how your school makes decision helps you plan strategies to get them to say yes. Why do parents need extra support getting services in school? Why do schools so no so often? What is a school’s special education profile and how can it help the parent? How can a parent request an evaluation for issues the child has? What can a parent do if the school says no to doing an evaluation? If they do the evaluation, how do they determine if the child is eligible for services? Why is it important to put everything in writing? For Twitter or Facebook you can include @BonnieLandau, #SpecialEdMom, #SpecialMomGuide. #SEMSG when you do your posts. Please notify us if you do a review or blog post on the book. We’d love to link to it from this site. If you have a questions or inquiry about publicity, please reach out!